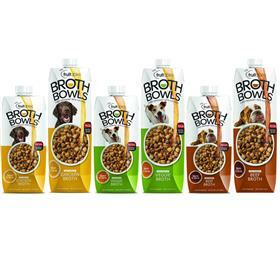 New and available in store: Fruitables Pet Food Broth Bowls. For the pet parent, an all natural product line that offers unbeatable palatability, only 2 calories per ounce, and completely pet safe, with under 0.07% sodium, no onions, garlic or MSG. — with Fruitables Pet Food. Instructions for Use: Simply shake and pour over your pet's food. Try warming broth first prior to serving, for an extra gourmet touch. A typical serving size is 1/4 cup per meal for a 30 lb. dog. Adjust accordingly based on your pet's weight. Do not microwave this container. Reseal and refrigerate any unused portion for up to 10 days. Beef Ingredients: Beef Stock, Roasted Vegetables (Carrot, Celery, Mushroom), Yeast Extract, Salt, Potato, Cabbage Exract, Natural Flavor, Bay Leaf. Chicken Ingredients: Chicken Stock, Roasted Vegetables (Carrot, Celery, Mushroom), Yeast Extract, Potato, Salt, Celery Juice Concentrate, Carrot Juice Concentrate, Turmeric, Natural Flavor. Veggie Ingredients: Water, Roasted Vegetables (Carrot, Celery, Mushroom), Potato, Yeast Extract, Salt, Cabbage Extract, Tomato Paste, Carrot Juice Concentrate, Bay Leaf, Canola Oil, Natural Flavor.